How to get variable value from URL query string in PHP? We already know that we can get URL query string variable in $_GET super global array. But sometimes we might have to analyze a string which is an URL with query string and need to pull out value of a given variable from that. Also, it can be that we were given only the query part of an URL as string and we have to find out value of a given variable. Lets see how we can face this issue. Among these parts, what is our concern is $parts['query'] which is having the query part of the $url. Okay, then we are cutting down the $parts['query'] using the parse_str() function, where we are giving the query part as the first parameter and the array to store all the variable and values. Thus we are getting the $values array filled up with variable and values from query string of the URL. Following is the output of the $values array. 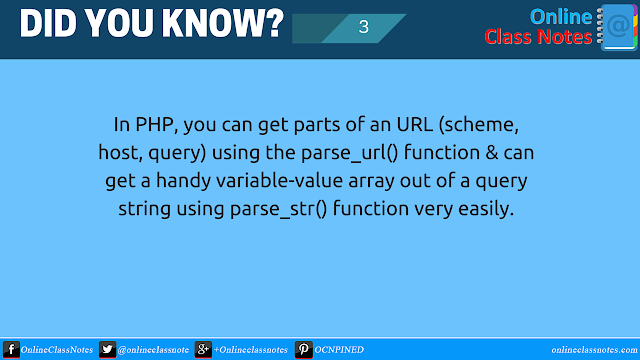 As this time, the $url is itself the query part of an URL, we do not need the parse_url() function anymore to find the query part of the string, so we can simply skip to the parse_str() function to get the desired output. Now from the $values, we can get value of any variable directly. Cheers.